Players on Reddit and YouTube are saying that both shirts they’ve created and shirts they have purchased are being removed from their inventories. One player who reached out to Kotaku was able to get a shirt refunded for his shirts, but said that he only got 10,000 VC, the price of about three shirts, when he says he paid for 10 shirts total at 3,500 VC each. You can earn VC by playing games or by purchasing it with real money, so losing VC is costly for either the player’s time or wallet. 2K did not respond to a request to comment in time for publication. 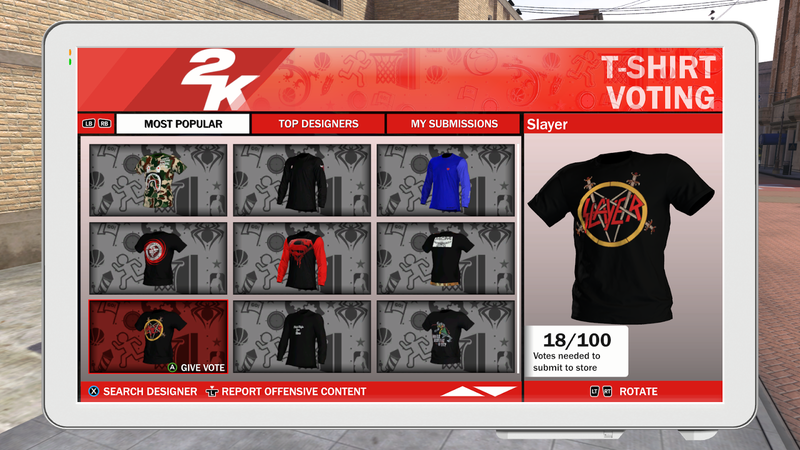 If you go to the in-game T-shirt kiosk and look at the submissions currently being voted on, you’ll see a plethora of copyrighted content immediately. In fact, the highest voted shirt at the moment is a plain black tee with the Superman logo on it.